In an unusual set of circumstances (ed: someone couldn't follow a simple embargo), this evening Intel is officially announcing its 8th Generation desktop CPU lineup, codenamed Coffee Lake. This comes roughly a week and a half ahead of its originally planned launch date (and still the shipping date) of October 5th. We’ve already seen part of the 8th Generation announced – the "Kaby Lake Refresh" based mobile parts – which included a bump in core counts for some of the formerly dual-core U-series processors, upgrading them to quad-core processors with HyperThreading. Meanwhile on the desktop side, there’s been some news that’s already found its way out, and as usual, some rumors as well. But tonight, Intel is finally and officially taking the wraps off of their latest lineup of desktop CPUs, along with the associated Z370 chipset. 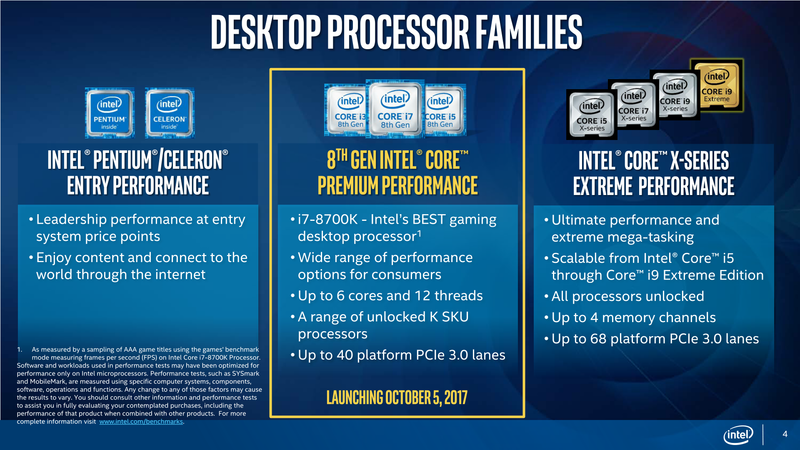 Although there’s a lot of new enhancements coming to the party, arguably the biggest one for most people is that Intel has finally expanded the core counts across the range, which is something they’ve not done on non HEDT systems since they originally went to quad-cores with the Core 2 Extreme QX6700, way back in 2006. If you wanted more Intel cores than four previous to now, you’d have to move to HEDT, but no longer. Core i7 is moving to six cores with HyperThreading, Core i5 is moving to six cores, and Core i3 is moving to four cores. (Boost) L3 TDP CPU Cores Freq. 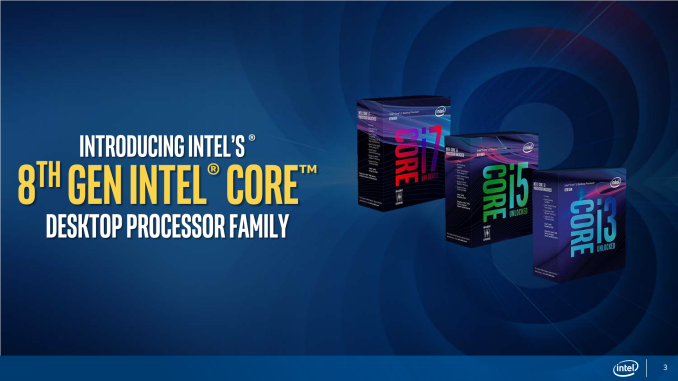 If you’ve got workloads that can handle more threads, the latest Coffee Lake parts should provide a significant boost in performance. We’ll have to wait for the full review to see how much of an increase this provides, but Intel is saying up to 25% more FPS and 45% better performance when “mega-tasking” compared to the Core i7-7700K. Those are fairly bold claims, so we’ll have to see how they make out, but it would not be out of the realm of possibility, especially on the “mega-tasking” where Intel is talking about gaming, plus streaming, plus recording of PlayerUnknown’s Battlegrounds, compared to the quad-core i7-7700K. Nothing comes for free, of course, and the extra cores on the i7-8700K do push the base frequency down 500 MHz from the Kaby Lake i7-7700K, although the boost frequency is 200 MHz higher. The latter is particularly interesting, as Intel isn't using "favored cores" ala Turbo Boost Max 3.0 here. Instead, these are typical Turbo Boost 2.0 frequencies, which is to say that each and every core needs to be capable of hitting these published clockspeeds. Or put another way, if you throw TDP limits into the wind, turning on a motherboard's multi-core enhancement (or equivalent) should get you a true 4.7GHz 6-core CPU without any real overclocking. Similarly, I strongly suspect that the lower base clock is for TDP reasons, as Intel has only increased the official TDPs from 91W for the high-end 7th Gen CPUs to 95W for the 8th Gen CPUs. 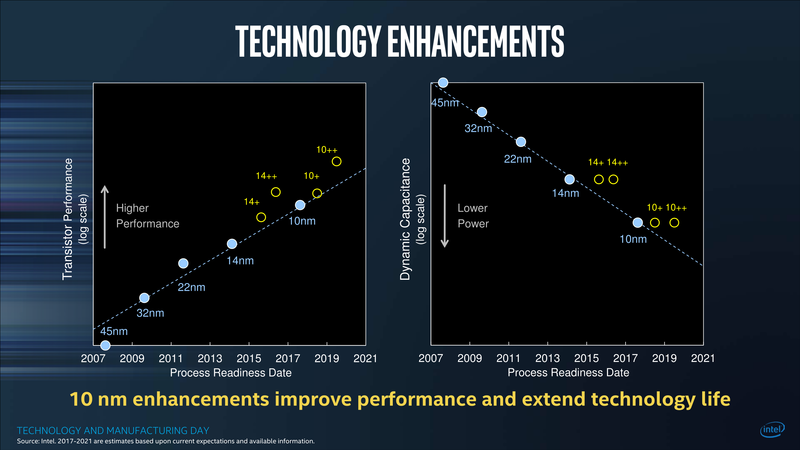 Suffice it to say then, Intel is aiming for high performance levels here. 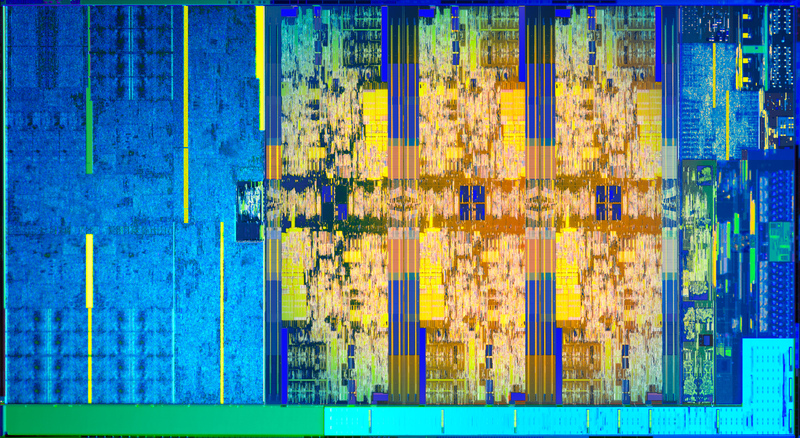 This isn't something that's going to touch Intel's HEDT Skylake-X family of CPUs in heavily multi-threaded workloads simply by virtue of lower TDPs and fewer cores – though the i7-7800X has just become redundant – but instead the new hex core models in particular are going to offer Intel's fastest single-threaded performance to date, coupled with an increased number of cores. So high-end buyers will find themselves picking between fast Coffee Lake hexes, somewhat lower ST performance Skylake-X processors with 8+ cores, and of course AMD's Ryzen lineup, which has lower ST performance still, but at the high-end offers 8 to 16 Zen cores. The downside for Intel mainstream CPU users through all of this is that prices are going up on Intel's high performance K model CPUs. Whereas the list price for a 7700K was $339, it's $359 for an 8700K, a $20 (6%) jump. Similarly, a top-end i5 has gone from $242 for the 7600K to $257 for the $8600K, a $15 (6%) price increase. And as always, keep in mind that these prices are per chip in a 1000 unit order; actual retail prices will be several percent higher still. So don't be surprised to see the 8700K closing in on $400 at retail. Meanwhile, along with the new Coffee Lake CPUs, Intel is also announcing a new chipset to support said CPUs: Z370. Intel's specifications for motherboards require improved power delivery over the previous models, to support the higher demands of more cores. They also support DDR4-2666 memory officially now. Curiously, the slides from Intel show integrated Thunderbolt 3, which would make a lot of sense since Intel wants to promote their own standard; however the company was unable to let us know if any extra silicon would be required to enabled Thunderbolt 3 after the chipset, which was the case with the Z270. Most likely it will be, as Thunderbolt's high speeds require transceivers/redrivers close to the ports. Intel did however clarify that HDMI 2.0a will still require an extra LSPCon (Level Shifter - Protocol Converter) in the DP 1.2 path. 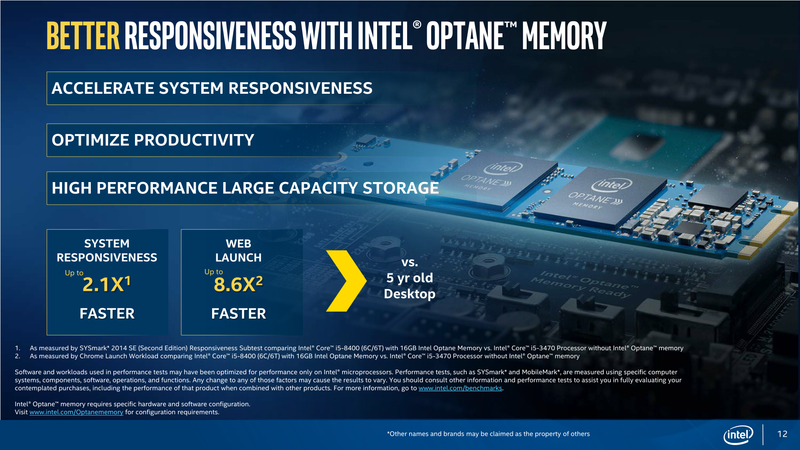 Intel is also promoting its Optane Memory, which is the cache version of their Optane brand. This isn’t new, and we’ve even had a chance to try out Optane Memory earlier this year. The numbers Intel quotes though are compared to an older system with a mechanical hard drive, and while Optane Memory will certainly help out there, so will moving to SSDs for your storage. 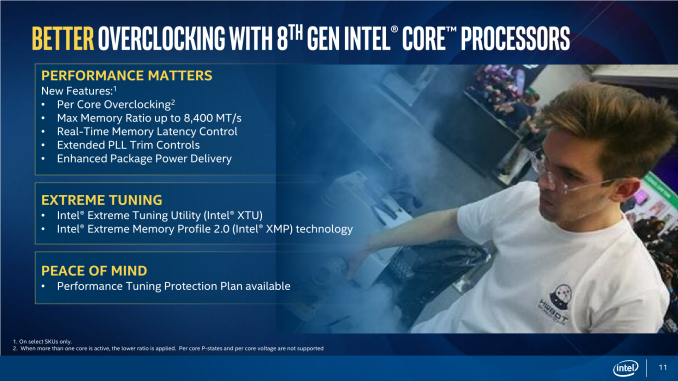 Intel is also touting the overclocking capabilities of the latest processors, which feature per-core overclocking, and other enhancements to let the end-user squeeze the last ounce of performance out of their purchase. Personally, I’m not into overclocking, so I’ll leave this section to Ian for the review. 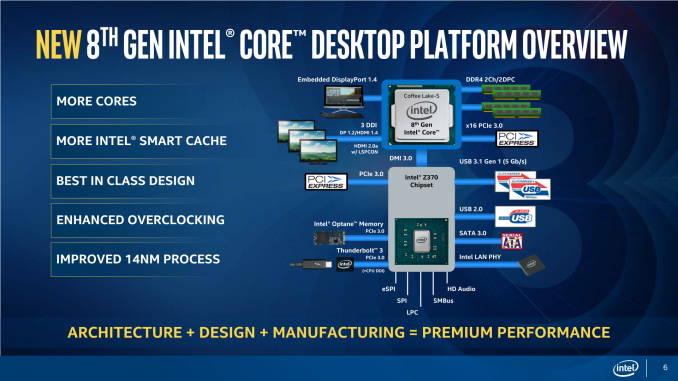 It's hard to imagine that Intel’s Coffee Lake is quite what the company wanted to offer when drawing up their plans a couple of years ago. But with increased competition, OEMs who prefer a regular cadence they can match their own product lineups to, and most importantly the well-published delays in getting their cutting-edge 10nm manufacturing process up to par, Intel has had to stick with 14nm again. However the upshot of this is that Coffee Lake is the first CPU family coming out of Intel built on their updated 14++ process, so while it remains to be seen just how good 14++ really is, under the hood Coffee Lake is going to be at least a little bit more than just a bump in the CPU core counts. Speaking of cores, Intel has also confirmed that relative to Kaby Lake, Coffee Lake still retains the same CPU and GPU architectures; Intel isn't rolling out any new architectural designs here. This means we're talking about Skylake CPU cores coupled with Kaby Lake GPU cores, though with what I imagine will be higher clockspeeds on the latter as well. So while Coffee Lake won't completely upend Intel's CPU stack – and this is why Intel isn't committing a massive faux pas by mixing Kaby Lake Refresh with Coffee Lake under the 8th Gen banner – a 50-100% increase in cores is hard to be upset about. The increased performance, especially in multi-threaded workloads, should help Intel in the desktop space, which is the one space where they have actual competition right now. After over 10 years of being stuck at 4 cores in the mainstream, intel finally has 6 and they plan on having 8 next year.